March 20, 2018 marks National Agriculture Day, a day to celebrate the abundance provided by American agriculture. Under the USAID-funded Farmer-to-Farmer program, U.S. citizens have generously volunteered their time and shared their agricultural expertise in development activities around the globe. Their experiences have helped farmers, extension agents, and university professors in developing countries fight hunger and poverty and provide valuable skills to the next generation of farmers. Today’s blog gives a glimpse of the volunteer experience from the eyes of a first-time F2F volunteer. I arrived in Dakar on December 2, 8:00 AM. As soon as I stepped off the plane, I felt the “vibe” of Senegal – the warm breeze, the energy of the people around me, and I could hear a faint musical rhythm coming from the terminal. This was my first trip to the African continent, and I was truly excited to be in a new place, surrounded by people talking a different language, living a different culture. I was prepared to see life through a new lens. The first person I met was Mr. Youssouph Sané, a member of Winrock’s staff who would drive me around for the next 2 ½ weeks. After brief introductions, he took me to the Ambre D’hôte for my first night in Dakar. He set me up with a cell phone and told me who to call if I needed help, and loaned me 10,000 African francs because it was Sunday and the money changers were closed. Then he left me until 9:00 AM the next morning. I was exhausted from my flight but was wide awake in a new place. No way I could sleep. After unpacking a few items, I walked out into the streets of Dakar. I just soaked it all in, the warm sun shone down on me as I walked for several blocks to the shore while the city carried on around me; traffic weaving through roundabouts, people walking everywhere, horse carts, motor scooters, colorful buses crammed full with people, shops and restaurants, tents and walled courtyards, the colors, and styles of the garments, the art studios, and the architecture, and the entryways into the courtyards….It was a beautiful tapestry of life, one I had never seen before, and it set the tone for the rest of my time in Senegal. The next day, Mr. Sané picked me up and drove me to the Winrock Offices. There, I met Ndeye Mama Toure, the Winrock Program Director in Senegal, and my translator, Mamadou Diouf. They briefed me on the socio-economic realities of Senegal, why the program was created, and the details of my assignment. 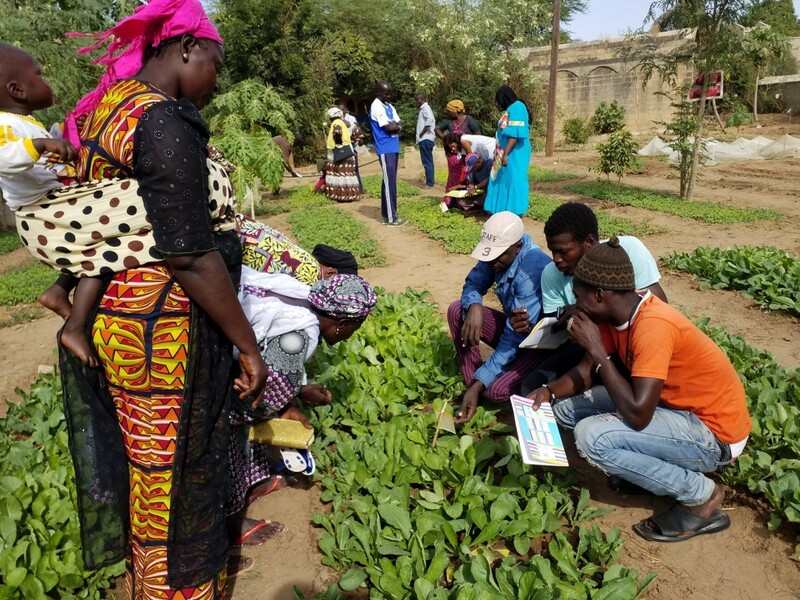 The Farmer to Farmer program in Senegal is designed to help alleviate some of the food insecurity in rural areas, as well as to provide a career path for young people interested in agriculture. As it is, Senegal has lots of available land and water, and a climate that is perfect for growing vegetables. However, many farmers do not have formal education or training in agriculture, and they do not have much capital to invest in infrastructure and supplies. From the briefing, I learned that the Senegalese government recognizes that successful small-scale farms can be a bridge to food security, good nutrition, and a secure foundation on which to build communities. 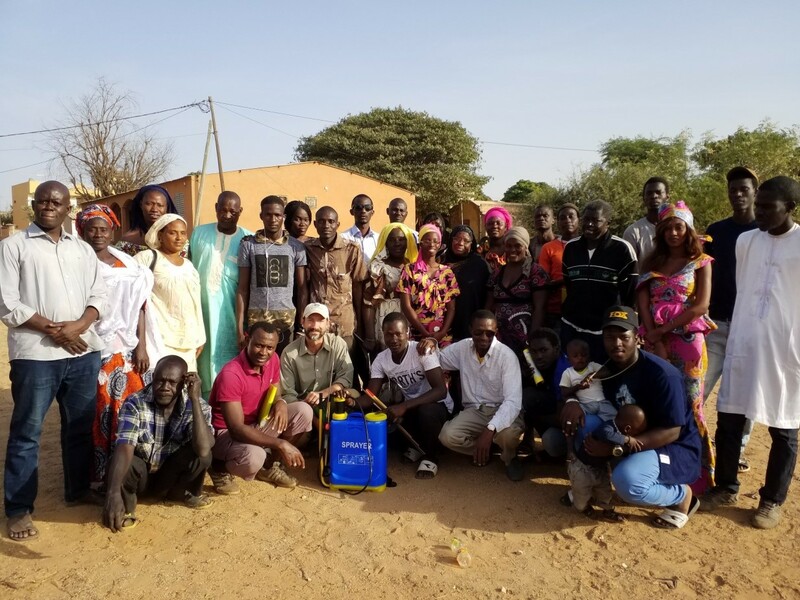 By supporting programs that educate farmers on new methods and innovations, the Senegal government is building local community frameworks that promotes economic development. My assignment was to assist in the development of a vocational horticultural curriculum for the Vocational Training Center of Nguekhokh (CFP Nguekhokh), so students and farmers can successfully engage in vegetable production, with an emphasis on food security, innovation, and organic methods of production. CFP Nguekhokh is located in the Theis Region about a one-hour drive south of Dakar near the coast. The eco-zone is characterized as a sub-Saharan environment with sandy soils, a dry season and a rainy season. My assignment started at the beginning of the dry season, early December. After my briefing, Mr. Sané, Mr. Diouf, and myself drove about an hour down the coast to the town of Somone, where we checked into hotel Africa6, a small hotel with a lot of character and friendly staff situated right on the beach next to the ocean. Every day for the rest of the assignment, I enjoyed my breakfast watching the ocean waves roll in and out a few meters from my table. These accommodations were the perfect space to experience Senegal and work on my assignment. Because I was given the assignment ahead of time, I had already started preparing a curriculum in advance, drawing from previously drafted course syllabus and teaching guides. 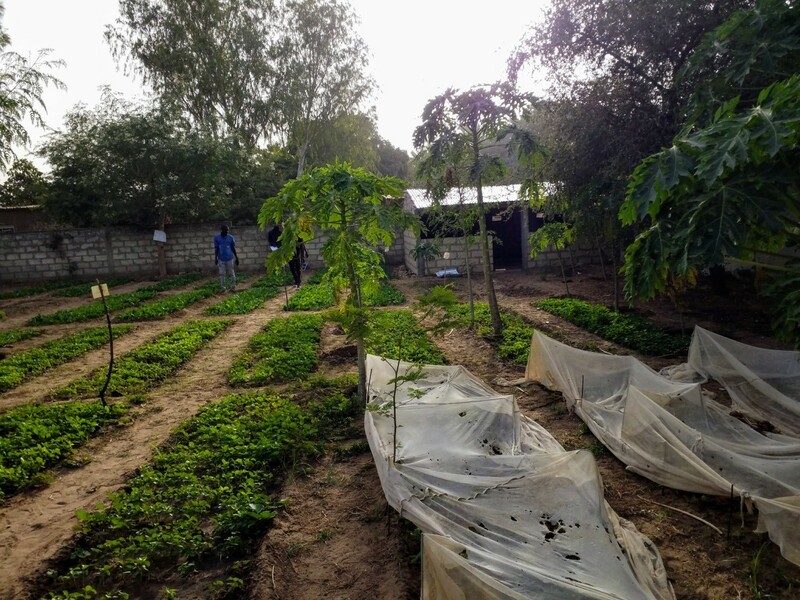 I strived to put together a curriculum that scaled down the normal educational components of vocational horticulture program to 5 lessons that I thought were innovative and/or essential to success in vegetable farming in Senegal. 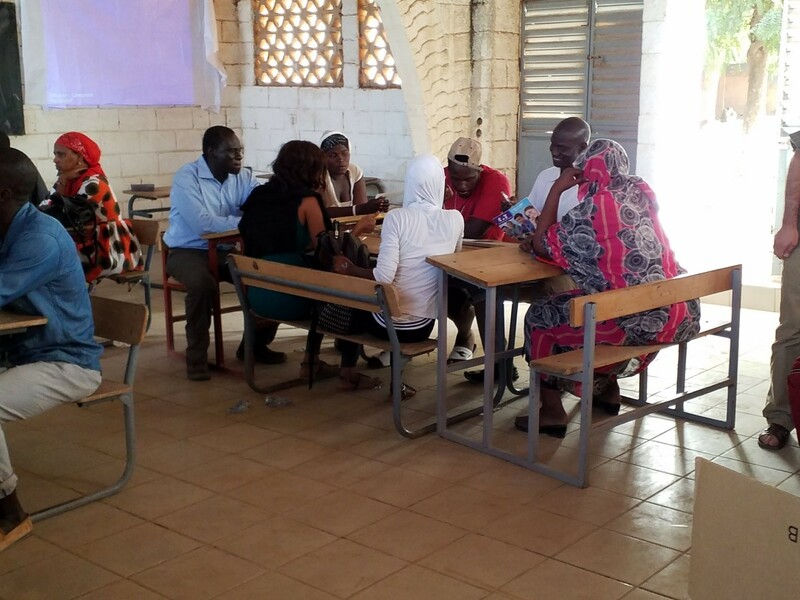 However, after I met some farmers in Senegal, and talked with the teachers and headmaster at CFP Nguekhokh, I realized that I had to change my lesson plans. Most of the curriculum I had prepared before leaving the USA was completely irrelevant to the reality of small-scale farming in Senegal! I quickly realized that the curriculum had to focus on a homestead-size scale of production, and empower farmers with very limited resources. The participants of the class had various levels of experience in vegetable farming and education. So, the curriculum had to be presentable to a wide audience, and be applicable to the very real issue of food insecurity. This made my assignment more challenging, and as a result, I had to be more creative in the way I drafted a relevant curriculum. I had to be more innovative in the ways I presented lessons and engage participants. I was thankful that Winrock had included some extra days in the itinerary for prep-time. I was also very grateful for my interpreter, Mamadou Diouf. Because of his knowledge in agriculture and education, I was able to re-write my lesson plans so they were more applicable to the participants. I was very happy to find a wonderful teaching resource at the training center. They have at the school a rectangular walled-in garden area for teaching horticulture, I estimate it to be 1/2 hectare. Within the walled garden they have a small livestock shed, and various scrub trees in the corners and along the edges. Near the entrance, a small clump of taller scrub trees provides just enough dappled light for a seedling nursery. At the time, there were 100 or so containerized seedlings, and several containerized papaya plants. There was also a big compost pile – black gold! On one side of the garden, I saw cucumbers, lettuce, cabbage, beans, and carrots. On the other side, there were several beds of hibiscus seedlings, radish, and onions, some overshadowed by a canopy of papaya. At the time I was there, all the vegetable crops were in the seedling stage. In the center was a 2 X 2 meter concrete water pool about 50 cm deep, which was fed by water pumped out of a well near the entrance, and off to the side. Across the walkway from the well was a 5 ft. termite mound. On the first day, with the help of Mr. Diouf and Mr. Sané, I started to present my curriculum. There were 15 participants. These were all the teachers and instructors at the training center. The first topic was “Record Keeping for Small Farms” and objective of the lesson was for the students to be able to set up a basic record keeping system for historical reference, and future planning. Farm production records can help small scale farmers secure grants, or micro-loans, and they can be adapted for organic certification, or food safety. After a brief power point presentation and discussion, students were tasked with creating their own record keeping system, utilizing the gardens at the training center. The second day, I felt much more relaxed. The number of participants increased to 30. They included the original 15 staff from CFP Nguekhokh and 15 more from another training center 300km away. Mr. Diouf informed me they were a very diverse group (some of the participants were full-time farmers and not able speak French, so he would be translating it into Wolof). Day 2 focused on the benefits of incorporating organic matter into sandy soils to improve fertility. The learning objective was simple: Strongly emphasize the necessity to continue building up the organic matter in the soil. 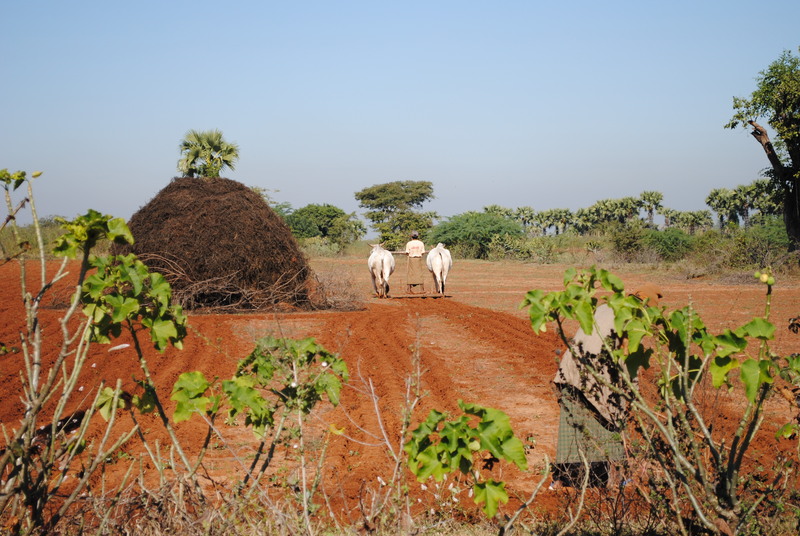 In Senegal’s climate, soil’s organic matter breaks down very quickly. Nutrient leaching, symptoms of too much nitrogen fertilizer, and signs of potassium deficiency were a few of the topics discussed. In the gardens that day, there were mutual demonstrations and discussions on how to use compost – how much to use, how deep it should be incorporated into the soil and its suitability for use as mulch. The learning objective for the third day was a general overview of horticultural practices. It was a veritable smorgasbord of horticultural tips and advise on how to raise vegetable crops on a small scale. Topics included crop rotations (which they were already familiar with) scouting crops for insect and disease control, sanitation – such as cleaning off tools – to prevent spread of soil-borne pathogens, managing cutworms with plastic cup barriers, managing whiteflies and other soft-bodied insects with homemade soap-based sprays, trellising structures for vine-type crops, companion planting to attract pollinators, and the use of catch crops to draw insect pests away from the cash crops. The participants demonstrated the skills necessary to scout and record pest observations, and plant health. They installed cutworm barriers around seedlings in the garden and built pyramidal cucumber scaffolds. From my 25 years of experience in agriculture, my observation is that farmers who innovate are the ones who prosper. Farmers must be creative in how they increase yields, with little-added expenses. So, the fourth learning objective of the curriculum was to teach participants that they can improve production methods through small-scale experiments and observations. As a competency-based approach to day four, participants were tasked with scouting the crops, as they did the day before, and note changes. But this time they there asked to observe whitefly populations among the beds of hibiscus in relation to neighboring crops. A lively discussion ensued among the participants as to the variation in whitefly population between a few of the beds. The crop’s exposure to sun vs. shade and fertility management were discussed in relation to whitefly infestation. We then did a hands-on experiment in water holding capacity of soils, and the final activity of the day was to plant eggplant seeds into containers with potting soils that had been amended with different amounts of compost. The students were assigned the future task of recording observations about the growth of the plants in each media. A hands-on lesson to observe the water holding capacity of different types of soil/compost mixes. Throughout my career, I have practiced and promoted sustainable agriculture, and organic methods of farming. But, I’m also pragmatic enough to know that people will feel compelled to use pesticides for many reasons, and pesticides are not going away. Mr. Diouf informed me that pesticides are used throughout Senegal with very little regulatory oversight. Therefore, I included, as a learning objective, some basic lessons on pesticide application. Topics included the use of personal protective clothing, gloves, and closed-toe foot-wear; the proper disposal of pesticide containers; proper time of spraying, and identification of the target pest and its life cycle. The competency-based task that the students were asked to perform was calibration of knap-sack sprayer when pesticide labels give quantity to be used over a given area (Ex: Liters/hectare). This exercise was well received, but I felt the mathematical components of calibrating the sprayer was not fully understood, and my presentation should have been clearer. However, the final lesson on how to make transplantable seed starting containers from newspaper and light-weight cardboard was very well received. It seems the assignment ended quickly…. too quickly. After the final lesson, all the participants gathered in a classroom, we had some refreshments together and said our good-byes. It felt as though my lessons got better each day as I became more comfortable with the methodology and working around the language barriers. I found that the most useful items I included in the curriculum were homemade “DIY” innovations and simple “garden hacks” – things like home-made sticky traps for controlling and monitoring insect pests, and how to make biodegradable paper transplant pots. We packed up and went back to Dakar for my last night in Senegal. Myself and another volunteer debriefed our assignments together over a very gracious lunch with Mama Ndeye Toure and her husband, followed by a driving tour of downtown Dakar. This experience, working with Winrock International in Senegal has enriched my life and I feel it has empowered my career. It was a very positive experience for me. More importantly, Mr. Diouf translated the participants’ comments and related that they enjoyed it as well and the curriculum was well received. So, I feel I accomplished what I set out to do. If given the chance to go back and build upon my previous assignment, I would not hesitate. In closing, I would like to extend a very warm thank you to the host, CFP Nguekhokh, Headmaster Mr. Mbagnick Kama and director of the horticultural program Mr. Waly Star for giving me the opportunity to present a curriculum that, I hope, will be the basis for future course development. I would also like to thank the Winrock staff in Senegal – Ndeye Mama Toure, Mr. Mamadou Diouf, and Mr. Youssouph Sané who were all very professional, and a pleasure to work with. Without them, I would not have been able to complete the assignment. Dr. 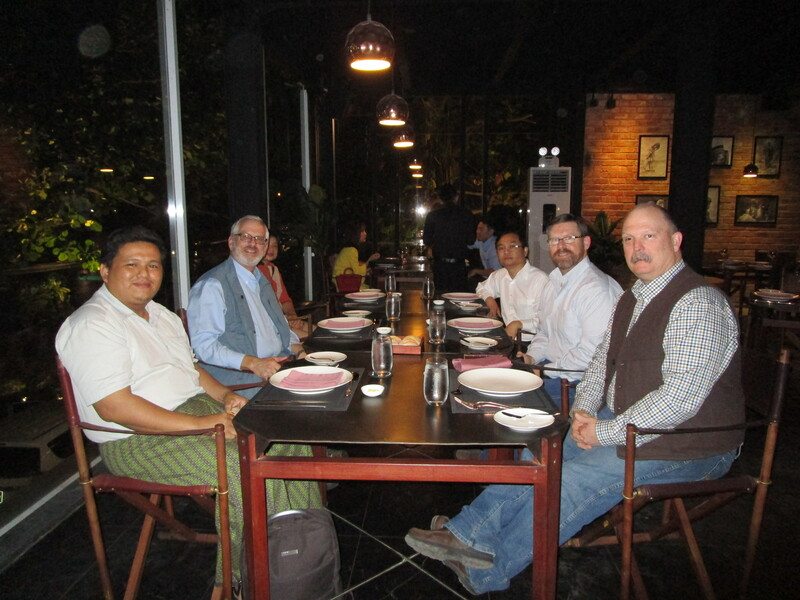 Herring was nominated by the Myanmar team because of his ability to quickly absorb the local situation in the field and adapt those observations into an informative presentation and training. He got along well with all the farmers he met, was well prepared and focused on the work. “Dr. 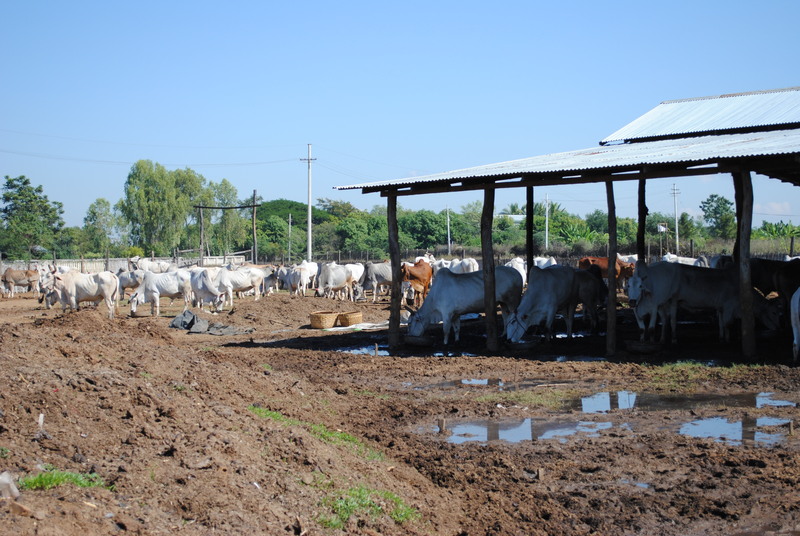 Herring’s assignment and shared information delighted the host and cattle farmers, it presented real opportunities in livestock export if they practice cattle farming systematically. It pointed out potential investment areas and possible collaboration between US and Myanmar” Ai Kyaw, Chief of Party, Myanmar. We asked Dr. Herring to reflect on his volunteer experience and the trip to Myanmar, his responses are below. 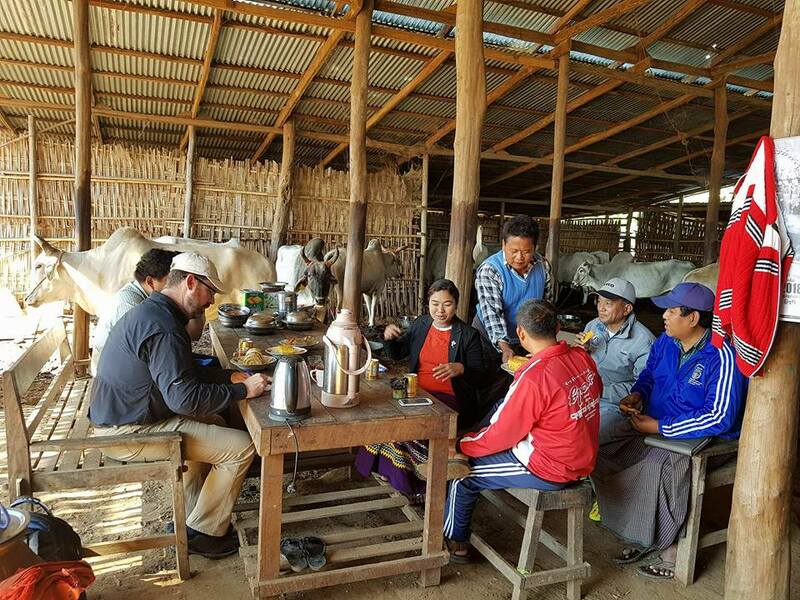 My Winrock volunteer assignment was to assess the Myanmar cattle industry and to make recommendations regarding potential improvements and developments as the industry there transitions from a draft-based cattle industry toward more organized beef production. I was in country from 1 to 13 January 2018, and my host was the Myanmar Livestock Federation (MLF). 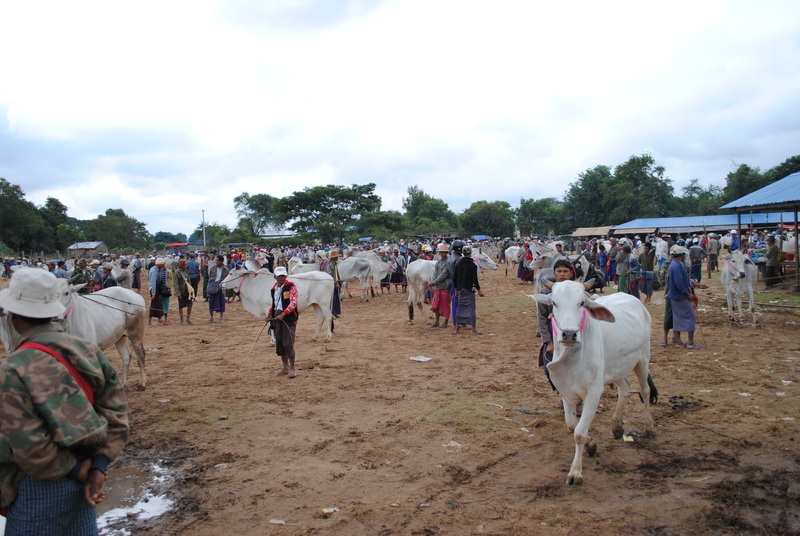 Cattle market near Pyawbwe. These cattle are bred and used for draft purposes. the farmers prefer gray cattle to red cattle. All transactions at this market must be completed by noon. 1.Why did you want to volunteer? I am interested in opportunities that expand my knowledge base, especially those that also help other people involved in animal agriculture, and particularly those involving cattle producers. 2. What was the highlight of your most recent volunteer assignment abroad? 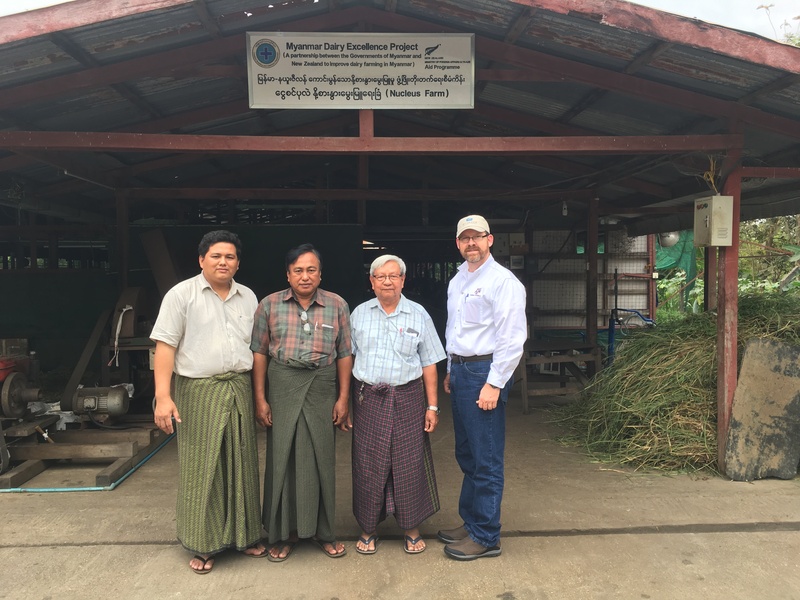 The most valuable resource in the world is people, and I thoroughly enjoyed meeting and interacting with people involved in the various aspects of livestock production in Myanmar, and experiencing their culture and friendship. Dr. Herring and the owners of a successful dairy farm. 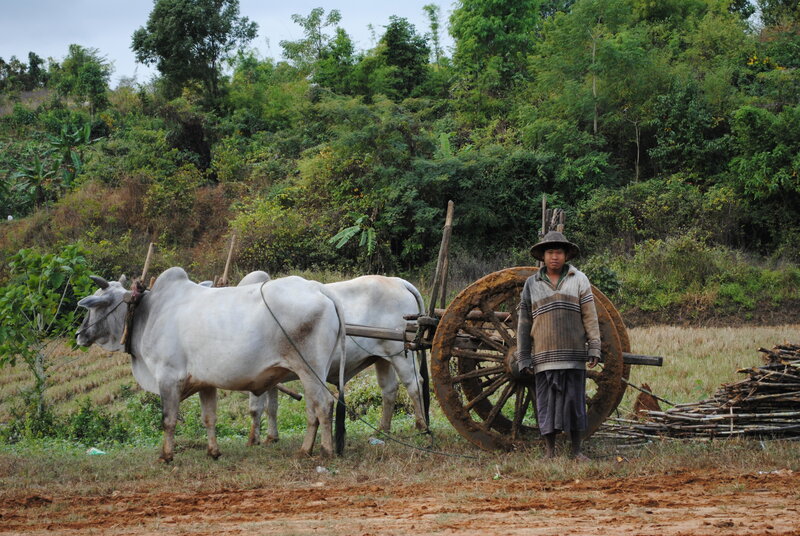 They have 56 cows on 2.5 acres of land in a suburban area near Yangon. The owners had also organized a milk collection cooperative company. 3.What made your Winrock volunteer trip distinctive? I had never been to Myanmar or this part of Asia. One of the most distinctive aspects of this trip was seeing the degree that farmers rely on their cattle for draft work and transportation, and to personally visit and contribute to one of the less developed countries of the world. 4.How does your experience affect your worldview? The first thing it does is reinforce my thoughts on how fortunate people in the USA and other developed countries are regarding our daily lives. Many in developed countries do not realize how little of our annual income we have to spend on food. In the USA, in particular, we also have many liberties that people in other countries do not have. The second thing it reinforces is how similar people all over the world are. sides per day. 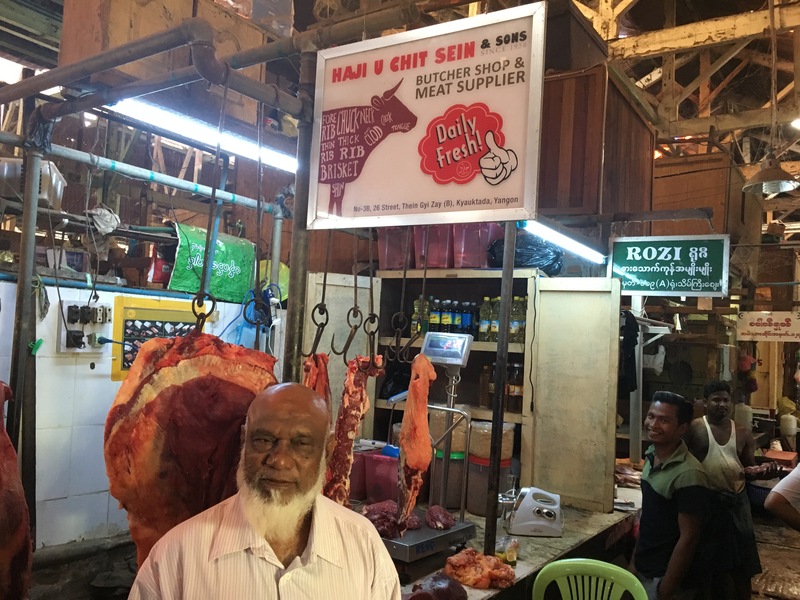 He supplies some restaurants and hotels in Yangon. 5.What advice would you give a new volunteer? 1) Keep an open mind about seeing new cultures and circumstances; it will be a great learning experience. 2) the people you meet will be very appreciative of your choice to volunteer. 3) don’t be afraid to ask questions, and always have patience and politeness. 4) the only impression some people may ever have about the USA could come from their experiences with you. 6.Why should people consider volunteering? It will be a tremendous learning experience, and it will be rewarding personally. Even if there is a day or two that you wonder why you agreed to volunteer, you will be glad you decided to do it. 7.How have your assignments made a difference in your own life? I have become more motivated to help cattle producers whenever I can. I have also become more motivated to work with producers and industry groups in developing countries. Dr. 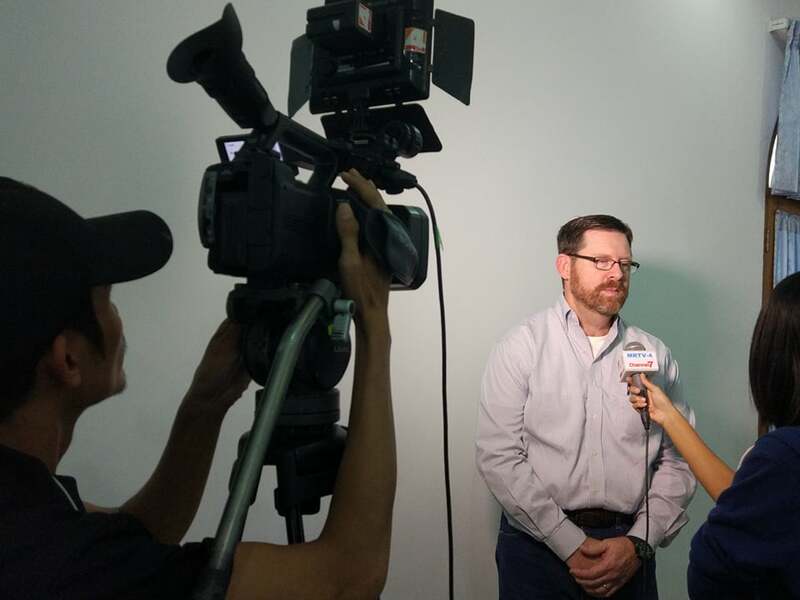 Herring gives an interview to a local TV station after a meeting between him, MLF officers and government officials. 8.How do you feel about the support from Winrock, whether before, during or after your assignments? The support I had before the trip was excellent. The in-country support that I received in Myanmar was outstanding and surpassed my expectations. All Winrock personnel were very professional and courteous in all my activities. 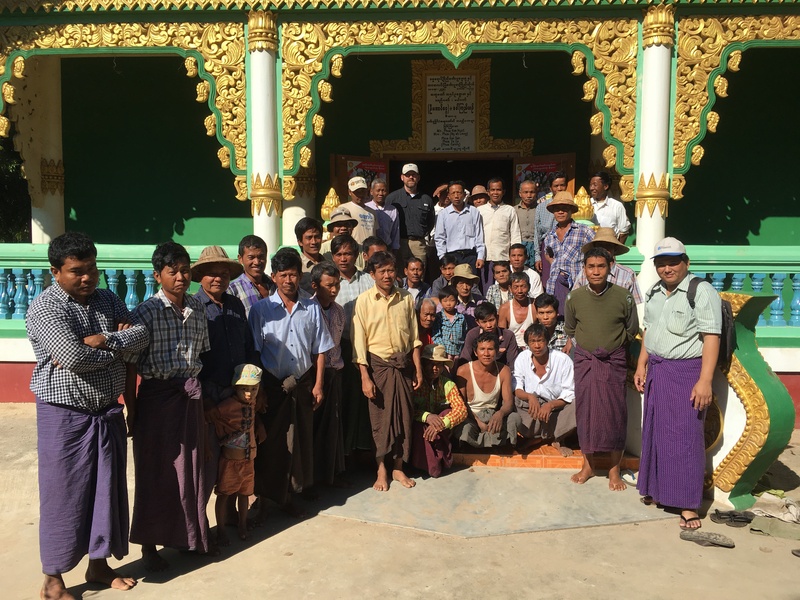 The Winrock Asia F2F Myanmar staff were excellent partners working closely with MLF to organize informative meetings, tours, and farm visits that not only helped me understand their industry and livestock production conditions but also helped me understand the culture and daily lives of Myanmar people. 9.When your friends and family find out that your volunteer assignment was abroad, what do they say or ask? The main questions they ask are about how different things were there compared to here. Some of those things include food (rice at every meal and lots of spices! ), living and driving conditions (which were much more congested than we are used to, and most cars are right-handed because they are used to cars from Japan, but they also drive on the right side of the road), and the cost of various household items (food and many items are much cheaper there than in the USA). 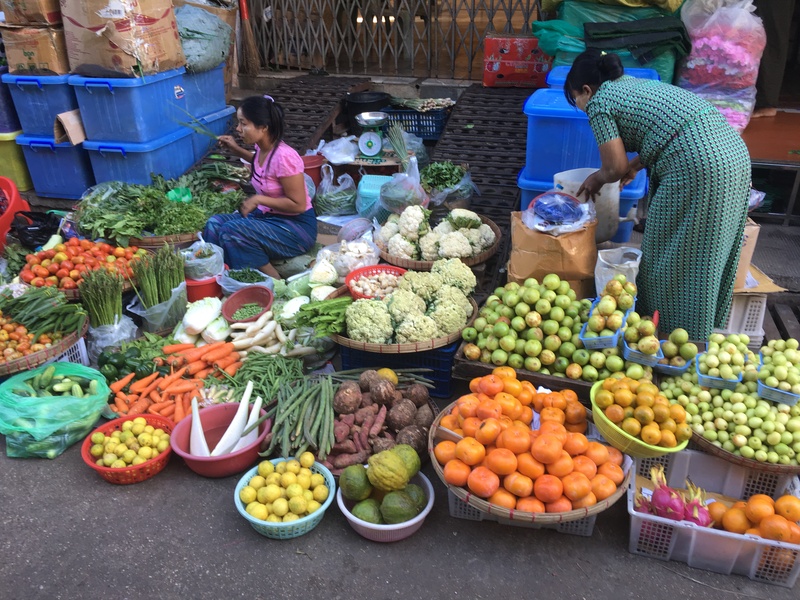 Food markets in Yangon are open 6:30 to 10:00 5 or 6 days a week. Many people buy their food daily because they have little storage area in their homes or have no refrigeration for perishable foods. 10.What do you do when you’re not volunteering? I am a professor in the Animal Science Department at Texas A&M University, and teach classes and conduct research regarding beef cattle production. However, my most important job is that of dad and husband, and my biggest challenge is time management. I also enjoy working outdoors on the small cattle operation my family and I have. 11.Does anyone in your life play a role in supporting your involvement? In providing inspiration? I try to minimize time away from my family, but they are huge supporters of me when I choose to go on volunteer assignments. As my children have become older, it has become easier for me to volunteer more. Both of my parents also encouraged me early in life to perform service and volunteer type activities. Yes, mainly through social media. I hope to continue communication with them in the future. 13.How do you feel that your volunteer assignment has contributed to creating a shared understanding of different cultures through person-to-person interactions? I am very glad to have contributed in a small way to a big-picture activity. The more that people understand and appreciate each other’s cultures, the more effective communication can be achieved, and more efficient learning and improvements can be made. The interactions I had with cattle farmers was very enlightening for both me and them. 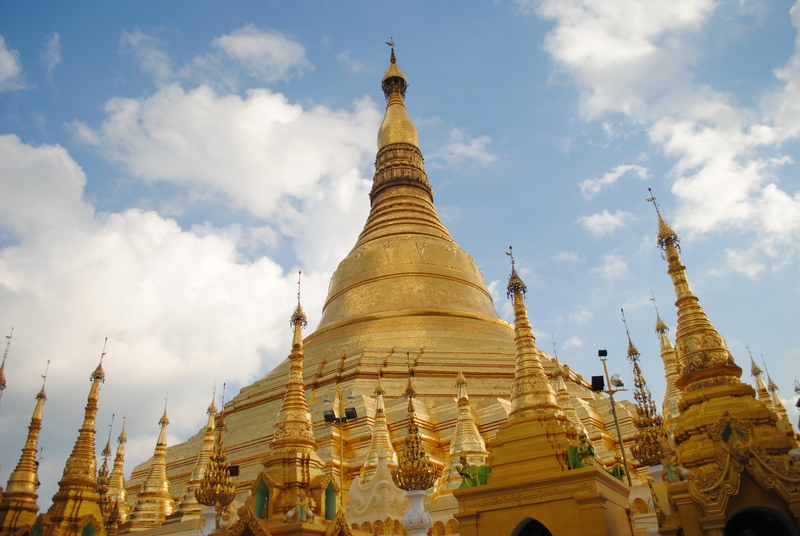 The Schwedagon Pagoda in Yangon. The first shrine on this site was built around 558BC and structures have been added to it by kings and queens through different dynasties. 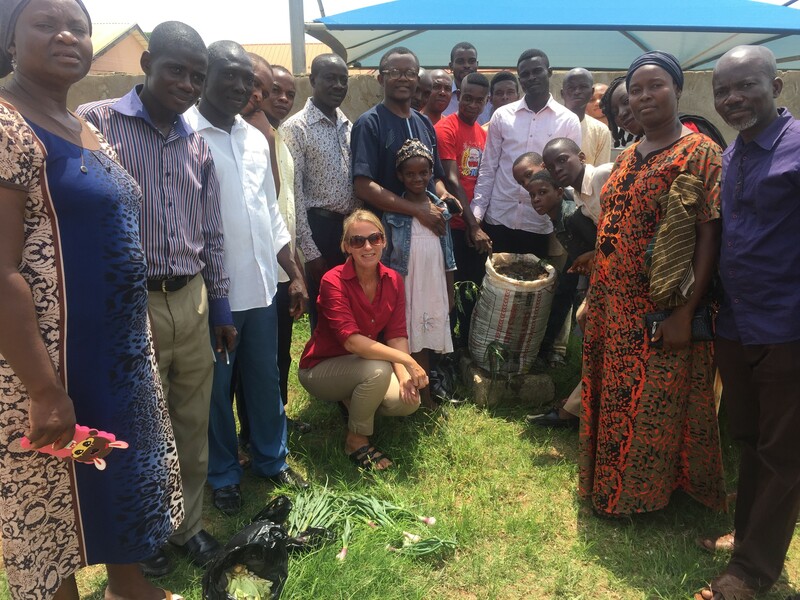 In the summer of 2017, Awakening Nigeria for Agricultural and Agro-Allied International (ANAAI) participated in training held by Winrock volunteer Anna Snider, working with Farmer to Farmer’s Agricultural Education and Training Program (AET). The training focused on homestead vegetable gardening using sacks and containers to help farmers, and others currently not engaged in farming, to embrace vegetable farming. ANAAI works with mostly female farmers in the Kaduna State of Nigeria and is dedicated to helping rural and urban poor boost their agricultural strengths which in turn enables them to better feed their families. In most parts of the state, lack of available land and socio-religious beliefs, some women aren’t allowed to come out in public thereby depriving such women of the opportunity to participate in food production, to receive useful and current information, and educational opportunities and technological innovations that could be of help to them and their families. This lack of opportunity put many mothers and children at risk of malnutrition. Sack gardening allows for space maximization, water conservation, and ease of practice while keeping financial requirements low, and improving nutrition, food security, and income. Many of the at-risk women have enough space within their fenced premises to grow food to support their families as well as earn some income by sacks/container farming. This helps empower women to take an active role in feeding their family while also interrupting the cycle of malnutrition, which especially hurts children and women who are pregnant. “This training has opened up our mind, now some of our women who don’t have land to farm can grow their own vegetables; above all we now know the importance of eating right and eating vegetables. We shall give this training to other women. We are glad we had this training.” Yahaya Hamman, farmer. Fast forward to January 2018, when Nigeria based Winrock International staff visited Kaduna on a routine impact survey. During the survey process, ANAAI informs the program staff that one of their member organizations, Thinkers Children Foundation (TCF), who had participated in the training on vegetable sack gardening went on to introduce and train school students and their families. 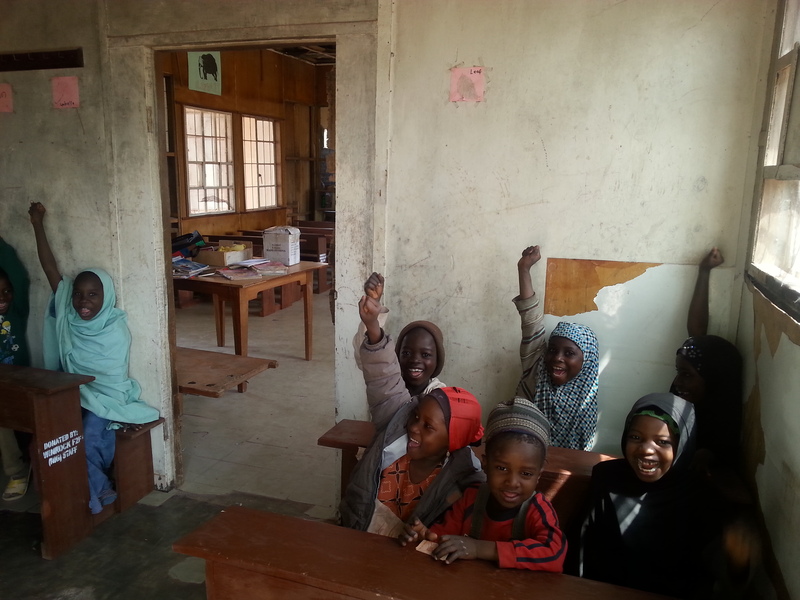 Thinkers Children Foundation (TCF) was founded in 2015, with a vision to give free primary education to children from internally displaced families, orphans, and the underprivileged. As part of TCF’s corporate contribution to national growth and development, it educates children and spreads awareness on the dangers of illiteracy. From 3 pupils in 2015, TCF has expanded to 80 pupils actively attending classes. 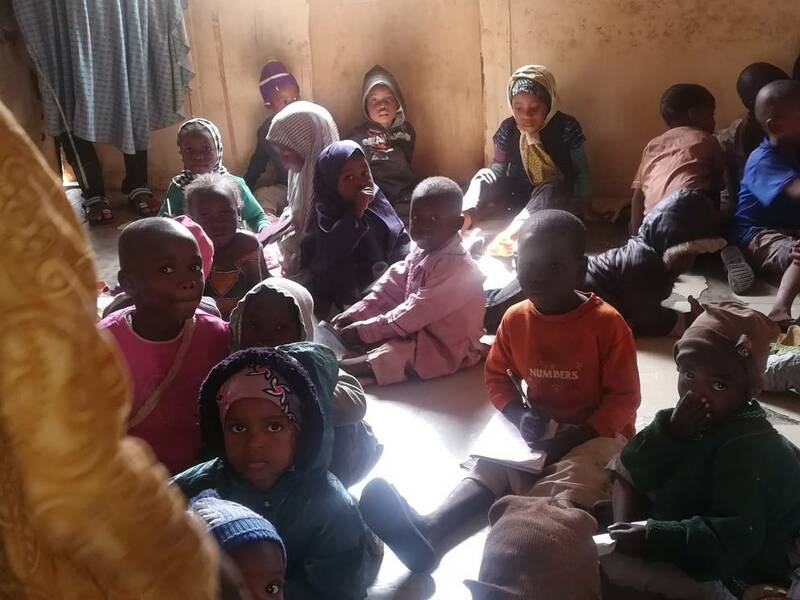 On that chilly morning in January, F2F staff arrived at TCF, where nearly 80 pupils were present, seated on the cold concrete floor in their makeshift school. They greeted the visitors with smiles and a chorus of ‘good morning’s. 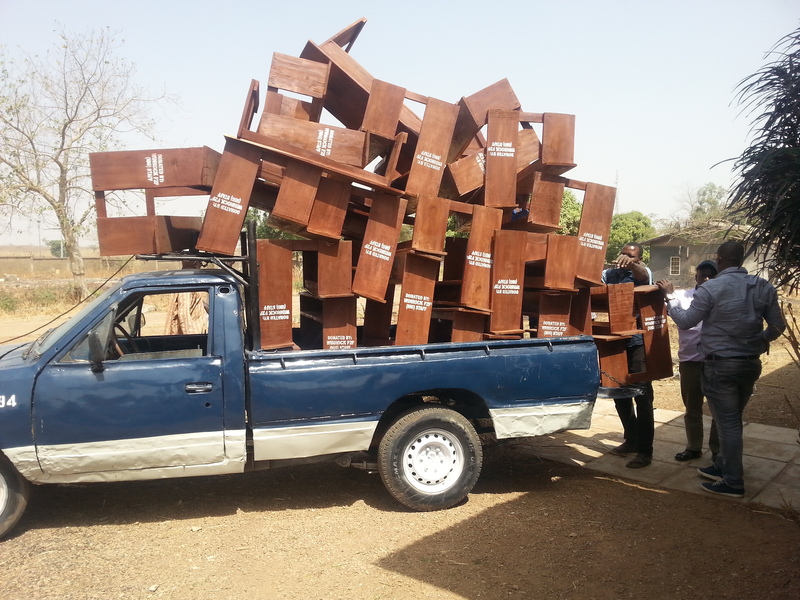 Inspired by the pupils and their enthusiasm, F2F staff pulled together their personal resources and donated 25 school desks to the foundation, complemented by 12 dozen notebooks. The F2F team was told that many of the pupils were practicing sack gardening at home. 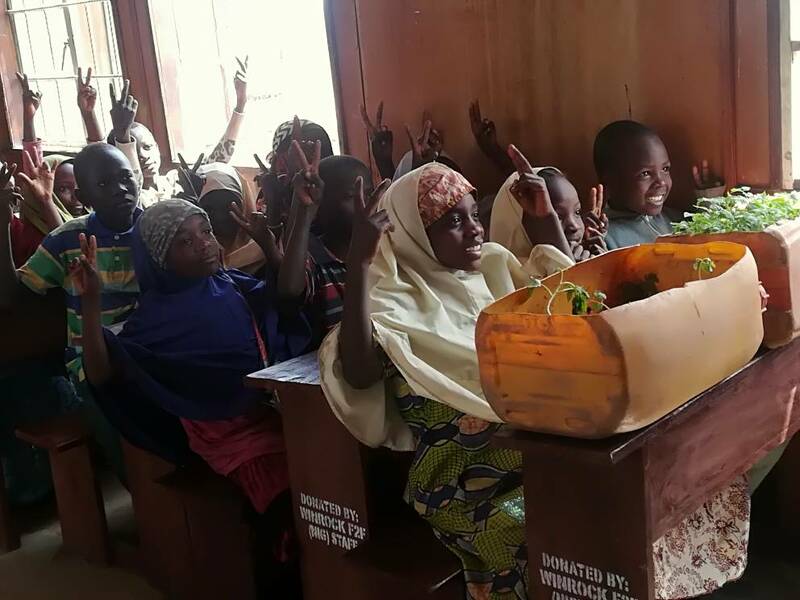 Of the many pupils practicing sack gardening at home, one such practitioner was 8-year old Abdulhakim and his 5 years old sibling (Abubakar), who took the message home and taught their mother. In an interview with F2F staff, Abdulhakim’s mother told the team that she is not only practicing sack culture but that she has trained three other women who are also actively practicing sack culture. She noted that adopting the sack and container culture has resulted in improved nutrition and savings in the cost of food for her and her family. She also reported that more and more women are making inquiries about how they too can grow vegetables in sacks and containers. “I used to think that it is only when you are in the village and have land that you can farm. Sack farming is so easy to practice, requires minimal space and water, does not require rainfall; the benefits are just unthinkable. I no longer buy vegetables for my family and as a matter of fact, I give some of our daily harvest to our neighbors and will begin selling soon. This is exciting and pleases my husband so much.’ Maimuna Ibrahim, mother to Abdulhakim and Abubakar Ibrahim. To see a video on how to make a sack garden, check out the Winrock Volunteer’s Facebook Page!